LONG known as farmer friendly, West Bengal is now making headlines for farmers’ suicides. Reportedly 31 farmers, including landless farm labourers and small traders of agriculture produce, in the state took their lives between October last year and January. Twenty-one of the 31 deaths are from the state’s rice bowl Burdwan district. And this is probably a reason the spate of suicides has garnered so much attention. Else, how can one justify the fact that despite an average of 1,200 farmer suicides per year in the past one and a half decades, the media seldom reported the deaths and the issue hardly ever turned political? In 2010 alone, according to the National Crime Records Bureau, 993 farmers in the state committed suicide (see table ‘Farmer suicides in India’ on the facing page). Chief Minister Mamata Banerjee has rubbished the reports of farmer deaths as “lies” spread by the Opposition to malign her eight-month-old government. But the Congress, coalition partner of the ruling Trinamool Congress, agrees with the Left parties in opposition. They blame a faulty procurement system introduced by her government this agriculture season for the mess in the country’s largest paddy-growing state. A visit by Down To Earth to Burdwan, however, reveals a deeper malaise. Farmers have committed suicide despite a bumper harvest. Most farmers in the district are big farmers with land holdings between one and five hectares. With yields above three tonnes per hectare, the district consistently outperforms the national average of 2.1 tonnes. Farmers say the above-average harvest led to market crash; paddy prices dipped below the minimum support price (MSP), the floor price decided by the Centre. The procurement agencies that purchase the produce at MSP offer only a marginal relief, which is meager to solve their multiple worries: accumulating debt from previous crop seasons and growing farm input costs and labour expenses. An analysis by Burdwan farmers shows the MSP for paddy has risen by Rs 30 per quintal (100 kg), whereas farm input costs have nearly doubled (see table ‘Cost analysis by Burdwan farmers’). “The increase is due to rising fertiliser prices, high charges for hiring a tractor as diesel prices have shot up and increase in daily wage rates following introduction of employment guarantee schemes,” says Ashok Ray, a farmer in Golsi-II block. Madan Ghosh, president of CPI(M)’s Krishak Sabha, explains, “In previous years, apart from rice mills, state co-operatives, women self-help groups and the state essential commodities corporation would procure paddy. But this year all procurement is routed through rice mills. This system is fraught with delays and farmers are left with no choice but to sell in distress.” To avail the MSP facility, a farmer needs to get a certificate from his panchayat, collect a token from the block development office and then approach rice mills. Even after this winding process farmers are getting paid in post-dated cheques, which bounce on submission. Anil Ghosh, for instance, sold 50 bags (3,000 kg) of paddy in January. He was given a cheque that he can encash only in March. “How will I grow boro or summer paddy without any cash?” he asks. Farm preparation for boro, a short-duration, input-intensive crop, begins towards the end of the winter. Around 30 per cent of the farmers in the district have decided to stay away from the fields this boro season as they have no money to invest. In fact, many are reeling under spiraling debt. Sushanto Ghosh was one such farmer. On January 18, he consumed pesticide in despair and died three days later. In the past two years, the 34-year-old had sold one hectare of land to repay his debts. 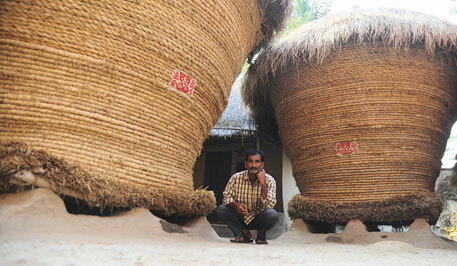 This kharif season, he harvested a good 900 kg from the remaining half-a-hectare but had to sell the paddy at a loss. He has left behind debts of Rs 80,000 from banks and cooperative societies and Rs 2.2 lakh from moneylenders. “Most moneylenders charge 5 per cent interest rate a month (60 per cent a year). Hardly anyone is willing to lend money this year as we are unable to sell our produce,” said Uttam Majumdar, another farmer whose debt runs over Rs 2 lakh. Majumdar and his brother sold 90,000 kg at MSP rate but are yet to receive the payment. Owners of rice mills, designated for procurement, complain the state government has not paid them, and hence the post-dated cheques. At 150 million tonnes, the 2011 kharif offered an above-average harvest of paddy for West Bengal, up from 130 million tonnes in 2010. Till January, the state government agencies had procured 416,000 tonnes; the target is to procure two million tonnes. Despite being the largest grower of paddy, West Bengal contributes four to five per cent to the Central pool, while Punjab and Andra Pradesh contribute over 50 per cent. According to the situation assessment survey by the National Sample Survey, one of its kind done in 2003, almost 50 per cent of farmer households in West Bengal were under debt burden; 42 per cent of their loans were from moneylenders and traders. The survey also reported that the percentage of farm households which “did not like farming because it was not profitable” was highest for West Bengal in the country. According to Madhura Swaminathan, economist at the Indian Statistical Institute, Kolkata, “A good harvest does not automatically translate into high farm incomes. Input prices have gone up and the informal sector has taken over from banks when it comes to supply of farm credit.” The Commission of Agricultural Costs and Prices (CACP) should revise MSP based on a realistic assessment of costs. For instance, she adds, it assumes the cost of credit to be 10-12 per cent, which, in reality, is much higher. The government tracks overall production but not household farm incomes. The data will help formulate realistic pricing policies and better crop and land use planning, she adds. In 2006, the National Commission on Farmers chaired by M S Swaminathan recommended fixing the MSP at 50 per cent over and above the costs. In contrast, CACP set the MSP for 2011 kharif paddy at Rs 1,080 per 100 kg: a bare margin of just 15 per cent over its own estimated costs of producing and marketing paddy at Rs 917 per 100 kg. But even that 15 per cent margin has eluded the paddy growers of West Bengal. I very much like the interesting story as it exposes the sad and worrying undercurrents exceptionally. The sad part is the rural business hub concept of the Panchayati Raj ministry, nor the backward region growth fund mechanism nor the district planning available under the Rashtriya Krishi Vikas Yojana could be tweaked by the state government or the district elected representatives to benefit the state. The important question therefore is to ask the question why this initiative could not be taken up the state functionaries? The fundamental is if the farmers have to gain from the bumper harvest they must be able to devise a mechanism to hold the stock in good condition for sale at a later period to derive time related escalation in the foodgrains prices. Did the district or the state plan recognise this key element and insist on implementing it. Did the state vociferously demand a new storage package under the Bharat nirman template? Unfortunately, no efforts seems to have been made thus enforcing the sad plight described in the story.The demand and supply of food for food security within a village must be made a responsibility of the constitutionally mandated village bodies and they must be supported in ensuring food and livelihood securities. It is the fact that 70% of our population depends on Agriculture....farmer is the king (Ryte Raju)as we are all eating food because of them only...they are the back bone to our nations' development... still, the farmers were not supported well to continue their production activity. Who is creating all these challenges?.... Certainly the non- producers? .....Why the authorities are not understanding these ANNADATAS (who provides food for all). During production - water, pesticides etc. In spite of all these challenges,still farmers are able to sustain these challenges and continuing production. it is the fact that many of them are migrating to do non-agricultural activities and facing its consequences on medical, social and economical aspects of self and family. When this creates severe vulnerability they commit suicide. Knowing that FOOD is the essentially part of our life, still the authorities are not supporting the farmers to do their production. It is clearly reflecting in the case of West Bengal Farmers. They are not pulling on with the production mainly due to the storage and procurement facilities. I hope this is the simple measure for the concerned authorities to resolve this farmers issue. Let us come out with clear and systematic need based strategies for supporting the farmers all over India so that we all can eat better food for leading better living with sustainability and quality of life (QOL).